Happy Holidays!! I hope my teacher friends are enjoying some well-deserved time off. I am off until January 2nd, and I plan to enjoy some relaxation with family over the next few days. The jammies are on right now and may stay on for a few days...ha ha!! I have decided to focus on writing as a goal this year. The CCSS curriculum for third grade focuses on personal narrative, opinion, and informational writing throughout the school year. I began the year with a unit on narrative writing. Though I use a writer’s workshop model, meeting with small groups and individually with students, (formatively) assessing and providing timely feedback has proven to be quite challenging. I have struggled with identifying those students that need the most help and reaching those students in a timely manner to provide further feedback and guidance. In addition, I wanted to find a more effective way to support those students who are meeting objectives but wish to move further ahead in their writing. My students use a writer's notebook for practicing the writing skills they learn on a daily basis. This is the place where they get to "fool around" with their writing and try out new things. I do not collect these, or grade them. When I work with students during a conference, we discuss the writing that is in their writer's notebook. It is a risk-free place where students can write and write and write, without worrying about perfection. This is the same way an adult writer would use a writer's notebook. They generate ideas here and practice skills we are learning within the context of stories, poems, and other writing they are working on. During writer's workshop, students must be working on the genre we are focusing on during a particular unit. But at other times, they are free to experiment with other genres in their writer's notebook. Some students even like to take their writing outside for recess! As we progress through a unit, students eventually choose a topic idea that they would like to take all the way through the writing process and develop into a published story. We call this topic idea their "draft" idea. This idea usually originates from an idea they've been playing with in their writer's notebook. However, now they will write this out in draft form in their drafting notebook. Our drafting notebooks are yellow legal pads. When students transfer a story to their drafting notebook, this signifies that they are no longer "playing around" with this idea, but they are ready to get serious about revising the piece and developing it fully using all of the tools in their writing toolbox. They may work on their draft for days or even weeks. Eventually, after some editing, students will make a final copy/draft of their work. This may take a variety of forms: a published book, a typewritten copy, or just written neatly out on special final copy paper. Using the that are provided by our district, as well as the Common Core Standards, I began by breaking the “Personal Narrative” standard into learning targets and determined how I could have students practice and demonstrate each skill in a manner that would provide me with instant feedback about who “got” it and who may need further instruction. This involved students practicing each writing skill on a graphic organizer worksheet in addition to utilizing the skills in their writer’s notebook. That gave me an easy way to gather their work, analyze it and then adjust my instruction either on the spot, or the very next day. 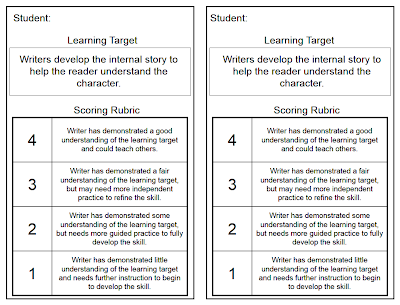 In addition to the graphic organizer worksheets, I created a 4-point rubric to rate the understanding of students on each target. 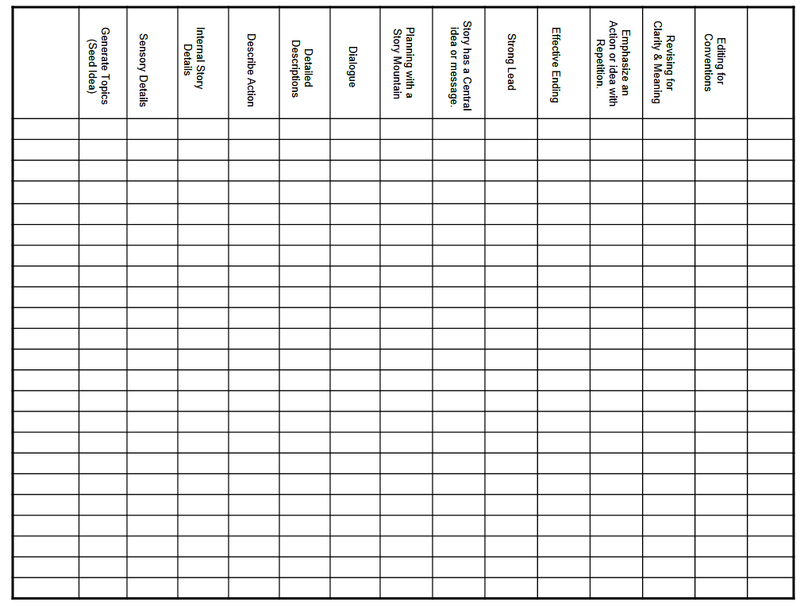 I used this rubric to create strategy groups and to guide our conferences with students, as well as for providing quick feedback to them the very next day (in addition to the rating on the rubric, I would write a specific tip or suggestion for each student). Those students receiving a 1 or 2 on the rubric would receive further guidance and instruction in a small group the next day. The 3s have the opportunity to work with a 4 to further develop the skill, and the 4s could use the tip or comment that is provided to move forward in their writing. 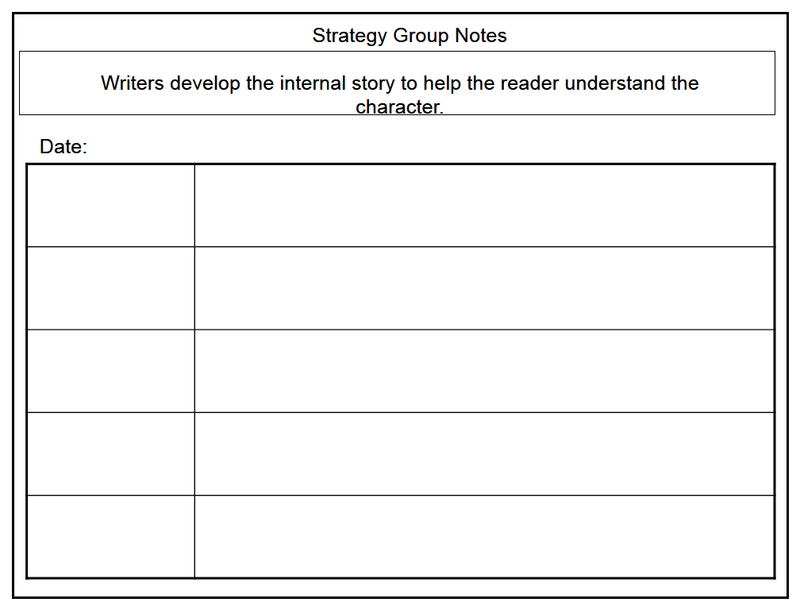 Students keep these graphic organizer skill sheets in their writing binders to use as reference sheets as they write. This formative assessment plan has given me a much better idea of who needs the most help with each learning target so that I could create an effective system for meeting the needs of those learners. I now have a road map not only for my daily mini-lessons with students (knowing when to review a concept and when to move forward) but I also have a plan for the one-on-one-conferring and small group work that takes place each day. I begin by reading over the graphic organizer worksheets for each student, and using the rubric to score and comment on each one. I then reflect upon the class as a whole and determine how the lesson was received: Do I need to review? Do students need more modeling…more practice? Should I offer a bit more to challenge certain students? I then use this information to plan my mini-lesson for the next day, and to determine which students need re-teaching of the concept in a conference, which need more guided practice in a small group, and which might just need more independent practice or a peer conference. I organize these groups and conferences for the very next day, so students can alter their work and apply their learning before a lot of time passes. Of course, I have encountered challenges in this process. I continue to struggle with finding the time to meet with all of the students in a timely manner. Creating peer conferencing groups and partnerships for those students who are “almost there” on a learning target helps a lot. However, it is a race each and every day to reach all of the students who need further guidance and instruction. 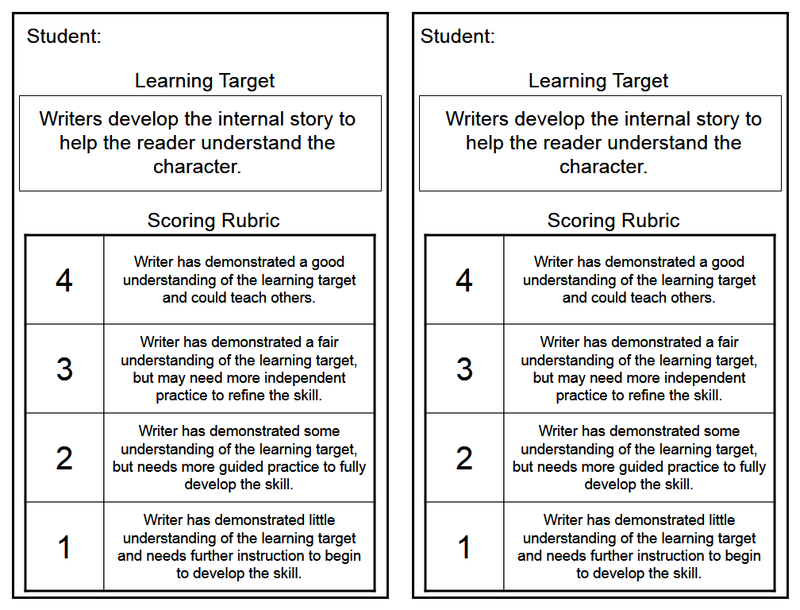 Another challenge has been helping those students who seem to be in the 1-2 range on the rubric for every learning target. It quickly becomes overwhelming for those students when they need to confer or meet in a group for re-teaching every day. I decided that those students would set a goal to improve on 1 or 2 of the learning targets during the unit, rather than trying to tackle all of them. Of course, they would continue to practice all of the targets within the context of their writing, but we would be holding them accountable for the 1 or 2 targets as we worked with them 1-2 times each week. This strategy helped to alleviate the time factor, while also giving those students a focus for their learning, enabling them to reach a goal before moving on to another. 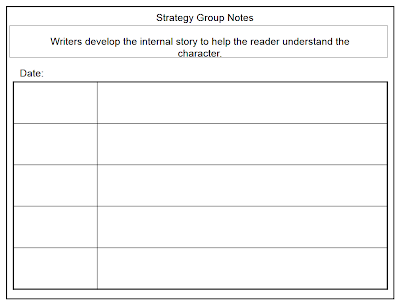 One additional challenge that I have encountered is that by having students practice a writing strategy out of the context of their writer’s notebook, I have created an additional step in the writing process. They demonstrate the strategy on the worksheet, using a section of writing from the story they are working on. They are then expected to also revise the section in their writer’s notebook. This has not been a problem for the majority of our writers, but for our struggling students it can be a bit confusing and cumbersome. Those students need daily assistance to make this transfer from the worksheet to their writer’s notebook, adding to the time issue. 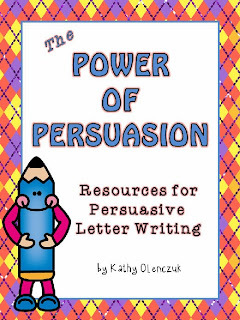 This process has made planning for my daily writer’s workshop easier and much more effective. In addition to my personal planning, our grade level (PLT) planning has much more focus. We are able to use the rubrics and the student writing samples to discuss intervention planning for the students who are still not getting it. Since all three teachers on our team are using this method, we are all able to contribute problem-solving ideas to help our students to succeed in writing. This has worked very well with our personal narrative unit. We plan to continue using this method with our next unit on personal essay writing. 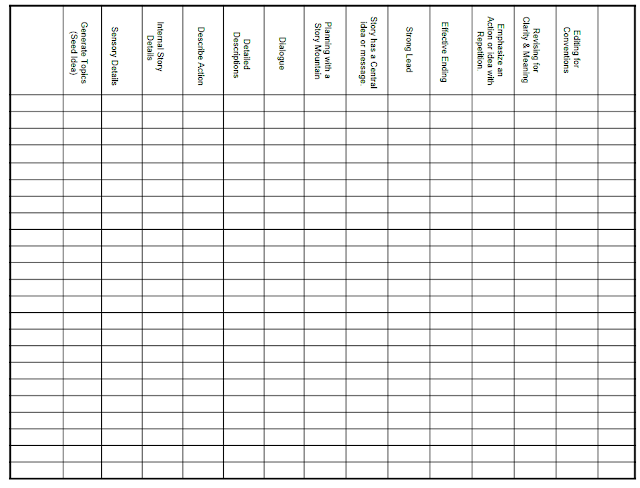 Here is the spreadsheet that I use to keep track of the student's scores, an example of the rubric/scale that I use to give student feedback on each skill sheet, and a sheet I use for creating strategy groups. Here are some examples of one student's skill sheets from our Personal Narrative unit. These are available at my TpT Store (see below for more information). Also, if you like the idea of using a scale or rubric to give your students feedback, you will like my Writing Assessment Tools. This pack includes rubrics and other assessment tools that are aligned to third grade common core standards. I am working on creating Assessment Tools for grades 2 & 4 also! Thanks so much for popping into my blog. I would love your comments and feedback! Anniversary Giveaway and a Pinning Party!